We’re constantly learning new things about health and nutrition, and recently I’ve become aware of some radical differences in the types of casein found in cow milk. I’d always assumed casein was casein, and that some people, perhaps many, have difficulty digesting this protein. It turns out there are actually two types of casein — A1 and A2 — and that different breeds of cows tend to produce more or less of of each. Actually, the A1 beta casein is a mutated form that has been associated with ill health and is produced by some types of cattle. Studies, including data from the World Health Organization (WHO), have linked A1 with increased risk of heart disease, high cholesterol, type 1 diabetes, sudden infant death syndrome, and neurological disorders, such as autism and schizophrenia, and possibly allergies. Some people may have an easier time processing A1 than others, but it may not be healthful for anyone. On the other hand, these health issues are not associated with consumption of A2 casein, which is produced by other types of dairy cattle, particularly Jersey cattle. 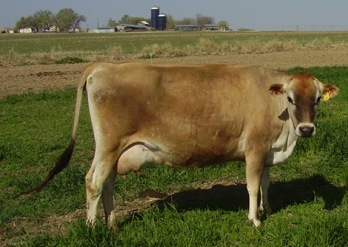 Most big dairy companies get their milk from a mixture of different breeds, and the predominant milk cow in the United States is unfortunately the predominant A1-producing type. In the future, we’ll see efforts in the dairy industry to identify A2-producing cows, and a company called the A2 Corporation is readying a labeling program for dairy products. In the meantime, Jersey dairy cows are noted as producing the healthier A2 type milk, as are goats and sheep. A spokesperson for Brown Cow Farm told me its Cream Top yogurts are made with milk exclusively from Jersey cows. I’ve also noted some cheese products labeled as being produced from Jersey cow milk. This entry was posted on February 1, 2011 at 12:28 pm and is filed under Uncategorized. You can follow any responses to this entry through the RSS 2.0 feed. You can leave a response, or trackback from your own site.